Note: The two ships travel in tandem as an "Armada", alternating itineraries each week. Note: M/Y Eric & M/Y Letty cruise operator Ecoventura alternates two different full-week, 7-night itineraries as required by the Galapagos National Park in an effort to better reduce usage on heavily visited sites. The order of visits may vary slightly based on the yacht assigned. This morning, you visit Punta Pitt on the northeast tip of San Cristobal, a tuff formation that serves as a nesting site for many sea birds including blue footed, Nazca and red-footed boobies, frigate birds, swallow-tailed gulls and storm petrels. 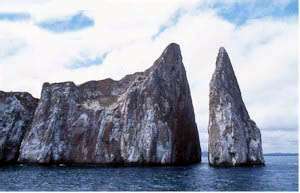 Punta Pitt is considered to be a first class site for birds and equal to Genovesa (Tower) Island. This morning you have a dry landing at Punta Suarez, where you witness the highest rate of endemic species in Galapagos. Sea lions noisily green us as you land on their beach. Curious Hood mockingbirds peck at the shoelaces. From April to November, the waved albatross, found only on Espanola, perform their wild mating ritual. Colonies of blue-footed boobies engage in 'sky-pointing' to show off for potential mates. Nazca boobies busily care for their young. Stunning swallow-tailed gulls are the only nocturnal gulls in the world. Red-billed tropicbirds take shelter under the cliffs. You also find Darwin's Finches, Galapagos Doves and Galapagos Hawks. Observe a unique species of marine iguana identified with traces of red and green colorings. Colorful sally light-foot crabs crawl along the shoreline near to the famous 'blow hole'. This morning you step ashore at Punta Cormorant, one of the few populated islands in the Galapagos. Floreana presents a rich history with mystery and intrigue. Set foot on a green-sand beach alive with the sounds of sea lions. Follow a trail to a brackish lagoon, home of the pintail ducks, common stilts, and the pinkest flamingos in the world. Wind your way past a rich variety of plants including morning glory, cut-leaf daisies, palo verdes and Scalesia trees, leading to a beach with powder soft sand. Sea turtles lay their eggs in the sand dunes and rays swim in the shallow water. After the walk, you have an opportunity to snorkel at Devil's Crown, a shallow sunken crater colonized by a brilliant array of colorful fish and corral. This morning you will travel by bus to the highlands of Santa Cruz Island. The scenery gradually changes as you wind your way through all seven vegetation zones found in Galapagos. Here you visit the tortoise reserve at one of the private farms in the highlands where you encounter giant tortoises in their natural habitat. You visit Los Gemelos, Spanish for 'The Twins', a pair of large pit craters where you find the bright red male vermilion flycatcher. You stop at 'the tunnels', the largest lava tubes found in Galapagos. This morning you will visit Bartolome, where it seems like you are walking on the moon. This young Island is inhospitable to most plants and animals. After a dry landing, climb 30 minutes up stairs leading to the summit of a once active volcano. Along the way, you pause to marvel at lava bombs, spatter cones and cinder cones. From the top of the wooden stairs, you can gaze out across the island for a panoramic view of the island and 'Pinnacle Rock', an eroded tuff cone. Crystal clear water is an invitation to snorkel from the beach or Zodiac with schools of tropical fish and Galapagos Penguins. This morning, you visit South Plaza, a small geological uplift with tall cliffs offering spectacular views. After a dry landing the trails lead you through prickly pear cactus (Opuntia) and Sesuvium. Here you can find the Galapagos Land Iguana feeding on the cactus leaves. Toward the end of the hill you encounter a colony of bachelor sea lions. The bulls are in various stages of recovery from battles lost over prime beach territory. You also find swallow-tailed gulls, shearwaters and red-billed tropicbirds, who build their nests along the cliffs. $200 per person that will be distributed with the crew and guides. Longer 15-Day/14-Night Cruises can be created by combining Itineraries A + B back-to-back. Call EcoAdventures toll free 1-800-326-5025 for details. Spend the entire day on Genovesa, one of the most spectacular islands in the Galapagos. This morning you will have a dry landing at Prince Philip's Steps. Find storm petrels and the elusive short-eared owl, and watch the famous red-footed boobies nesting in palo santo trees. After the walk, swim or kayak, then take a Zodiak (called 'pangas; in the Galapagos) ride along the jagged shoreline. On your ride, observe the beautiful red-billed tropicbird. This morning you will visit, Las Bachas, which is the Spanish translation for 'barges'. There is a long stretch of a soft white sand beach and interior lagoons where you find the greater flamingo. There is also a wonderful chance to snorkel here from the beach. This morning you will have a wet landing at Punta Espinoza, Fernandina Island. 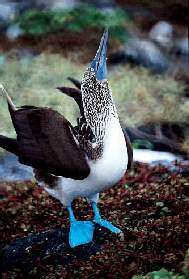 Fernandina, located in the western part of the archipelago, is the youngest and most pristine island of the Galapagos. Here, observe hundreds of marine iguanas, the largest colony in the Galapagos, bask in the sun along the rugged shoreline. Watch also groups of sea lions lounge and resident bulls carefully guard their territory. See flightless cormorants build their nests on the point and Galapagos hawks fly overhead. The morning the excursion is a zodiac ride to Elizabeth Bay off the shore of Isabela Island. First you will visit to a secluded cove, lined with large red mangrove trees. Here, turtles, rays, and shore birds can be seen. You will then motor to the rocky islets known as 'Las Marielas', where a colony of nesting penguins, flightless cormorants and giant marine iguanas are found. Take a morning stroll along the shore at Puerto Egas, Santiago (James) Island, to look for octopus, starfish, and other sea life caught in the tide pools. At low tide, catch a glimpse of marine iguanas as they feed on green algae. Watch also for great blue herons, lava herons, oystercatchers, and yellow-crowned night herons. End your walk at the grottos and deep clear pools for an encounter with fur sea lions, which formerly lived on the verge of extinction. This morning, disembark for a bus excursion to the highlands of Santa Cruz Island. Enjoy a variety of scenery on this winding road to the Charles Darwin Research Station. Here, scientists from all over the world conduct biological research from anatomy to zoology. Observe the tortoises, learn about the captive breeding program, and get your picture taken with the giant tortoises. Afterward, stroll through the town of Puerto Ayora (population: 10,000), the largest town in the Galapagos. Buy souvenirs, mail postcards, and absorb local charm in the social heart of the islands. There is an additional charge (see full details in the itinerary description). Itinerary B - Passengers can disembark in the morning after breakfast or participate in the morning tour to the highlands.